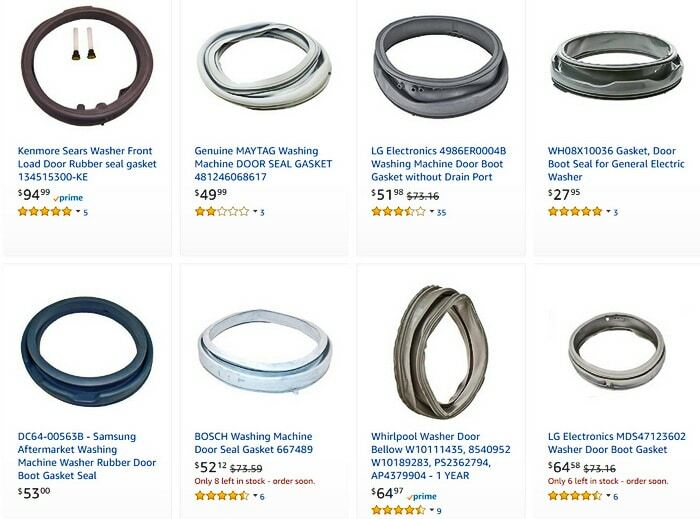 What is the best method to clean a washer door boot gasket? Most front loading washing machines have a large grey gasket or diaphragm seal around the door. This gasket or door boot is what keeps the water from flowing out of the washer when in use. This is one part of the washer that needs to be cleaned and stay dry to avoid it from ripping, cracking or getting mold/mildew build up. Below we will show you how to care, maintain, and clean your front load washer door gasket. TIP: It is a good practice to keep the front load washing machine door open when not in use. This is done to keep the inside of the washer dry and prevent mold or water damage on the door gasket. Also, after each use of the washer, wipe down the diaphragm inside and out so no water sits in or on the gasket. Prolonged water sitting in or on the washer diaphragm will eventually get mildew, mold and or damaged from the water. If mold grows on your washer door gasket, try to clean it off immediately. If mold or water damage has eaten away at the rubber diaphragm, it may need to be replaced as it will begin to smell and or leak water. How To Prepare A Front Load Washing Machine Door Gasket (Diaphragm) For Cleaning. 1. Make sure the washer is turned OFF. 2. Open your front load washing machine door. 3. Be sure that the washer is completely empty. 4. Be sure there are no substances on the grey diaphragm between the washer lid and the washer drum. 5. Check the diaphragm by turning it outward to be able to see the full gasket inside and out. 6. Remove are any foreign substances on or in the gasket such as socks that are stuck, leftover detergent, hardened soap, or mold. 7. Inspect the diaphragm for any areas that may be stained or discolored. 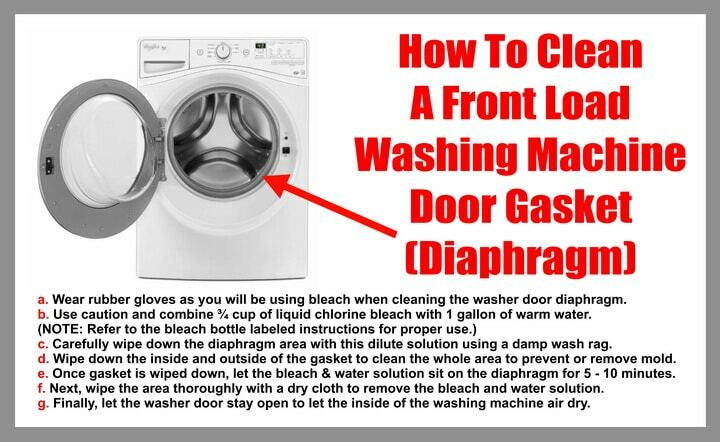 How To Clean A Front Load Washing Machine Door Gasket (Diaphragm). a. Wear rubber gloves as you will be using bleach when cleaning the washer door diaphragm. b. Use caution and combine ¾ cup of liquid chlorine bleach with 1 gallon of warm water. 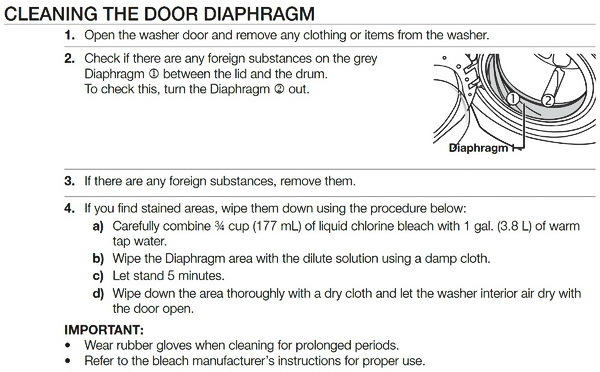 c. Carefully wipe down the diaphragm area with this dilute solution using a damp wash rag. d. Wipe down the inside and outside of the gasket to clean the whole area to prevent or remove mold. e. Once the gasket is fully wiped down, let the bleach and water solution sit on the diaphragm for 5 to 10 minutes. f. Next, wipe the area thoroughly with a dry cloth to remove the bleach and water solution. g. Finally, let the washer door stay open to let the inside of the washing machine air dry. h. If you find the washing machine diaphragm damaged, see below for replacements. Washing machine gunk in gasket on Front Load Washers – How to clean & remove? Need assistance with your front load washer? Please leave a comment below and we will assist.